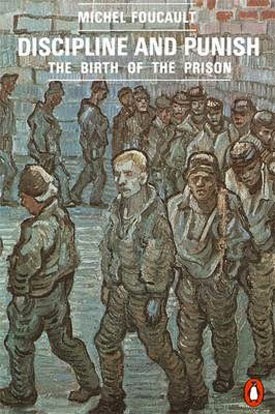 Michel Foucault’s Discipline and Punish charts the trajectory of penal justice from pre-enlightenment forms of torture and public execution to the birth of the modern prison. This historical/sociological study is not a simplistic narrative of humanity’s progress from barbarism to a civilised society, but an interrogation of enlightenment values and the problems inherent in the type of society they engender. This is not to say that the fruits of the enlightenment project are without merit for Foucault. As will be seen, there are potential benefits, such as individualised support and the potential for self-improvement within these systems. But it is clear that Foucault is more keen to raise awareness of the hidden power structures and the insidious state control of the individual that support our modern society than to praise our collective progress out of the perceived “dark ages”. When people speak of “the Enlightenment” they are talking about a period in European history roughly encompassed by the “long 18th century” (1685-1815) wherein the primacy of human reason, and its capacity to effect change were key philosophical and political beliefs. Famous thinkers of the Enlightenment include Immanuel Kant, David Hume, John Locke, Thomas Paine and Rene Descartes. The Enlightenment signified a break from the past and its modes of operation, focussing instead on the present and concerted efforts for its improvement. Enlightenment values invested the individual with personal dignity and centrality. This facilitated a reassessment of rights and liberties. Reforms were driven by a utopian hope of realising the full potential of both individual subjects and social institutions. The nobility of these aims is commendable, but, as Foucault’s work reveals, the utopic ideal often creates its opposite in practice. Discipline and Punish begins with a very graphic description of one of the most awful cases of public execution; Damiens the regicide. He was tortured and then drawn and quartered at agonising length when the horses failed at the first and even subsequent attempts. This disturbing scene plays into preconceptions about the barbaric history of torture and execution in Europe, seeming to support arguments for the unthinking brutality and unconscionable cruelty of past ages. As Foucault’s discussion of these cases develops, however, a slightly different, though no less shocking picture emerges. The torture and execution of criminals was not senseless or reactionary, but a methodical, measured response to the crime. There was what Foucault describes as a ‘legal code of pain’ (p34), which dictated exactly the duration and type of pain to be inflicted, and the method of final execution depending on the details of the crime. There were also instances of symbolic torture and execution where the crime would in effect be written on the body of the criminal. At this time, all crimes were perceived as an attack on the abstract “body” of the sovereign, a body that symbolised his/her power. Corporal punishment served to restore that body to its fullness by taking revenge on the body of the criminal. As a statement of power, these punishments relied on the sense of spectacle they engendered in the general public, who were participants in as much as observers to the workings of justice. The visible results of torture and the public space of the execution were contrived as a statement of sovereign power. This power was furthered by the royal pardon; the only means by which an execution could be lawfully prevented. Aside from the obvious humanitarian issues with torture and execution, Foucault cites and in fact emphasises the importance of various economic and social reasons for the reforms to criminal justice seen in the 18th Century. He argues that as Europe became wealthier, the nature of crime shifted from violence to property, and an increased population required new methods of policing and control. In focussing on these reasons, the tenor of Foucault’s investigation is already a little cynical. In describing the foundations of modern society, Foucault uses the image of a plague town as a template of the perfectly governed community. By Foucault’s estimation, the plague town is a perfectly ordered and controlled society: everyone in their own “cells” with a system in place to check the status of everyone’s health and deal with the deceased. As a counter to this image of segregation and analysis, he offers the image of the leper, marked and separated from the community, as symbolic of the pre-enlightenment society. The plague town provides a parallel to the structure Foucault perceives as being at the heart of our modern institutions; the Panopticon. Originally conceived as an architectural structure by the Enlightenment philosopher and founder of Utilitarianism, Jeremy Bentham, Foucault is interested in explaining how this architectural structure came to inhabit the very core of our society’s institutions as an unseen but foundational mechanism. 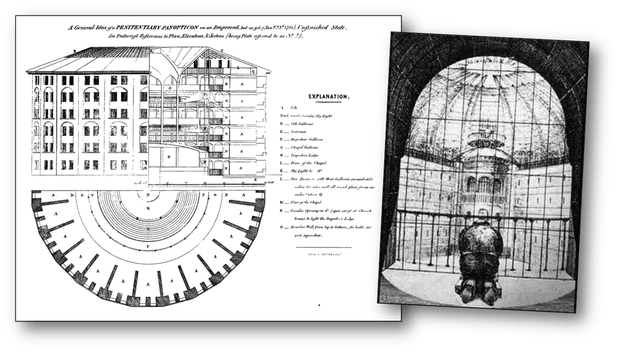 Bentham’s Panopticon is a circular structure divided into individual cells around its circumference with an enclosed tower in the centre from which the cells can be observed. The primary strength to this structure is that every cell is observable at all times so that the occupants of the cells can never know when they are being watched. They therefore internalise the sense of always being watched and self-monitor their behaviour accordingly. The disciplines form the heart of the panoptic society according to Foucault. They are the means by which individuals are controlled, and through which they learn their role within society and follow the path put before them. The foundational example of a discipline that Foucault uses is the military, wherein manoeuvres are dictated down to the slightest physical gesture and there are clear grades of progression or ranks. The disciplines operate through a system of supervision and examination; much like schools. Evidence of these disciplines is to be found in our day to day interactions and modes of communication, which can be thought of as a kind of social conditioning. Foucault outlines a shift from a regime of torture to one of discipline. A move from punishment to reform, from disorder to order, from sovereign power to social power, from visible spectacle to invisible surveillance, and traces the darker elements of each of these “progressions” or “improvements” to breed an awareness of the power structures underlying our modern lives and the surveillance state in which we live. The disciplines offer the opportunity for self-improvement beyond what could be expected without such individualised and focussed training, and the knowledge of individual lives gathered through observation and collection of data feeds back into the improvement of services. Whether these improvements are worth their cost in lost privacy and personal freedom is, however, a matter for debate.